Turnstone, a Steelcase brand, has introduced the Bassline collection of commercial tables. 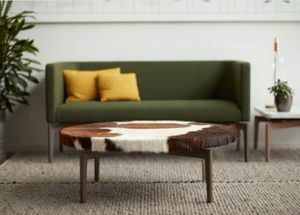 Touted as uniquely adaptable, Bassline pieces are intended to allow customization — and personality — into the typically subdued context of the workplace. Alongside a choice from the full line of standard tops and finishes, customers can commission the use of a diverse variety of custom tops, creating one-of-a-kid pieces for the contemporary office. A wide array of textures and colours can be incorporated onto the tabletops, which can be made from reclaimed artifacts and custom objects — as well as a choice of Turnstone’s standard Laminate and Veneer options. Wood, steel, stone, and a variety of other materials can be used to create the tabletops, allowing for a fairly wide range of customization. Bassline’s innovative platform supports up to 800 lbs., while the legs are intended to subtly blend in to the surrounding space to better allow the tabletop designs to serve as focal points of the room. According to Turnstone, the strong platforms allow for anything from a “reclaimed barn door to grandpa’s workbench” to be incorporated as a custom tabletop. The custom tops have a maximum overhang of 2” for round platforms, while for all other shapes, overhangs of up to 5” are possible. Bassline standard tables are available in all Steelcase High Pressure Laminates (HPL), Low Pressure Laminates (LPL), Open Line Laminates (OLL) and an assortment of Veneers. Legs are available in all Steelcase Standard Paints, Accent Paints, Lux Coatings and PerfectMatch. For standard tables, five basic shapes are available, all of which come in a variety of sizes.